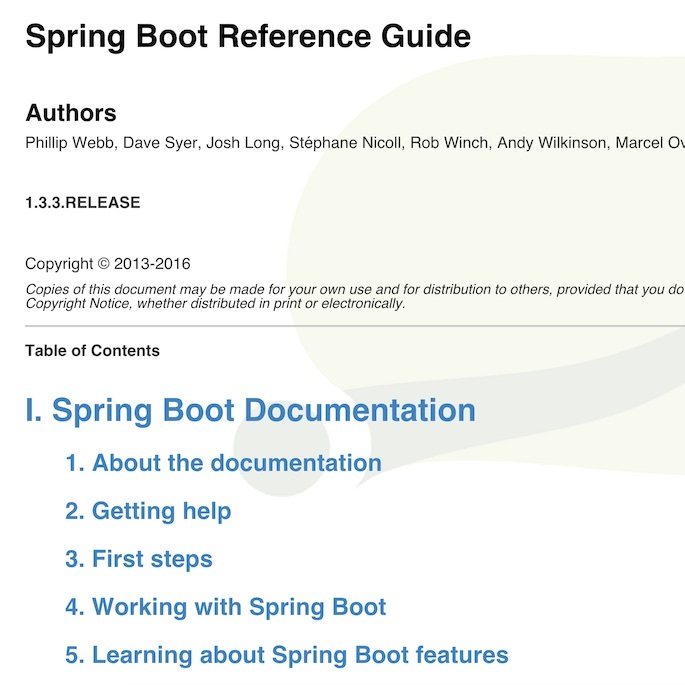 This reference by @phillip_webb is a really good in depth introduction into all details of spring boot. Even though it's not about spring-data and all the other spring projects, it always provides as much information, which is necessary to understand what's spring boots role in the play. In 2011 mnot wrote about json linking. Now it's like 4 years later and time to take a look at the link formats in json, which are used by lots of people. Also, the title attribute has special semantics on this element: Title of the link; alternative style sheet set name. The advantage of the <link> tag in XML is, that you could put it anywhere in your document (like the <a> tag in HTML). If you want to achieve web linking (rfc5988) in JSON, there are multiple approaches. This post shows some of the widely used JSON media types and how they deal with links. I will have a short look at HAL, Collection+JSON, Hydra/JSON-LD, Mason, Siren and UBER. Example files for all of them are in this json links gist. With this setup we will make two servers using a shared storage as high availabile mount. Both of them host the data, if one of them is down, the other one will stay the source of truth for so long. Disadvantage of this approach is, that the files exist 4 times: at server1 and server2 each with /mnt/barrel (the mounted directory) + /var/glusterfs/barrel (the glusterfs working directory). This makes the glusterfs server available and will allows us to connect to the server later on. If you are working with SCSS/SASS, you might still wonder how to organize your CSS classes. The pre-SASS conventions like OOCSS seem not to be necessary in SCSS, since SCSS has mixins, placeholders and variables. But there is one very powerful feature of SCSS, which we want to take advantage of now: inline sub selectors in selectors.